Then comes the fun soak – the brine! I’m feeling a sense of anticipation! Since we are having Christmas at our place this year (after MANY years of travelling elsewhere), I have also been put in charge of the turkey roasting. It’s been a LONG time since I last did a turkey. My first plan was to do something similar to the roast chicken I sometimes make – with garlic and citrus and herbs on the inside and outside and hope for the best…..hahaha! I always find roast turkey to be on the dryer side….and so not really much of a favourite for me. But THEN…..a chance comment made by my friend, Moira, yesterday…… “brining”…..as in she was going to go home after work, take her turkey out of the freezer, get it thawing and then let it sit in a herby brine for another day before the final roasting. That word perked up my ears….and immediately it crossed my mind that this method – entirely new to me! – sounded like it would be a cool way to add extra flavour…..and moisture?…..to a roast turkey. Moira, indeed, confirmed to me that I was on the right track. so, as soon as I got home, I googled – I’m just so google-savvy these days, eh? (hey, if your kids prod you often enough, you take the plunge…..what can I say….) – and found a goodly number of potential sites that offered up some tasty brine recipes as well as directions on how to accomplish this task. And well, Martha Stewart’s version sounded the most tempting to me…….no, the bottle of dry riesling was NOT the determining factor! Hahaha! Nah…she puts in juniper berries and coriander seeds and bay leaves and more good things. Yes, well, I figured that bottle of wine would only just ENHANCE the whole thing even more. In case you’re wondering, the turkey is chillaxing in a brine-filled bag inside a clean bucket (bought expressly for that purpose) in a cooler filled with water and ice. That’s when the stuffing gets made and the next steps are followed…..
Oh what will the final results reveal about this turkey experiment? No matter how much you love to cook, it IS a special treat when on occasion someone else in your family will do the cooking. So, naturally, when every so often my boys will offer to cook supper, my face breaks into a smile and I give up the kitchen space for them to create something delicious. 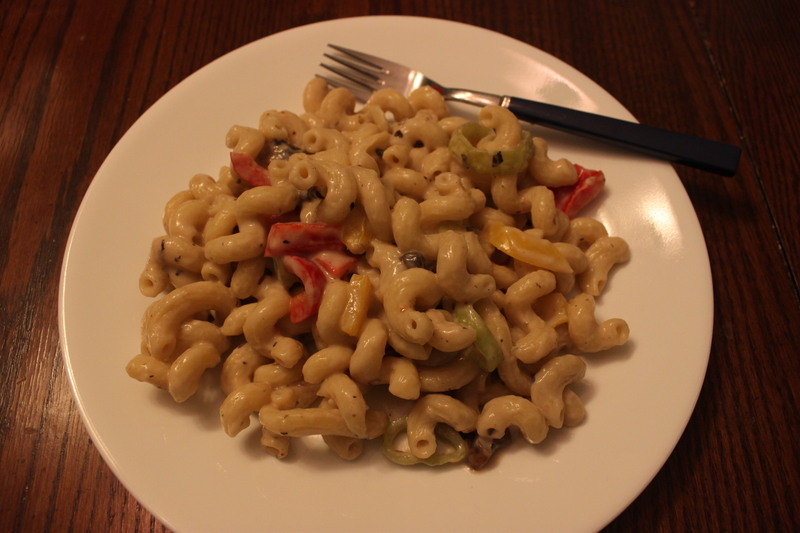 As I was heading back home earlier this evening – after a quick stop at the grocery store in which I purchased some sweet peppers, hot peppers, mushrooms, and alfredo sauce at a good price – I wondered whether I could entice Conrad and Stephen to put together what has become a specialty of theirs – Lightly Spiced Alfredo Noodles with Veggies. I didn’t have to twist their arms…..haha! And they immediately got busy with chopping up veggies and getting noodles boiled, etc. Conrad has developed a strong liking for spicyness in his foods and will often add a goodly amount of hot sauce – different kinds – into his dishes. In the past there have been those sessions where we had to say to him that the sauce amount he had used was so overpowering, we couldn’t taste anything else! Haha! But as with everything, over time, practice helps improve one’s skills. Spice amounts are adjusted….new herbs are tried out, and then more and more the dish gets perfected. Well, tonight’s version was exactly that – a perfect blend of sauciness, veggie crunchyness, garlic undertones, herbal flavouring, and JUST the right amount of zingy spice to enhance the overall taste. YUMMY! Yes….we had seconds and thirds. And one more, please, Mom! 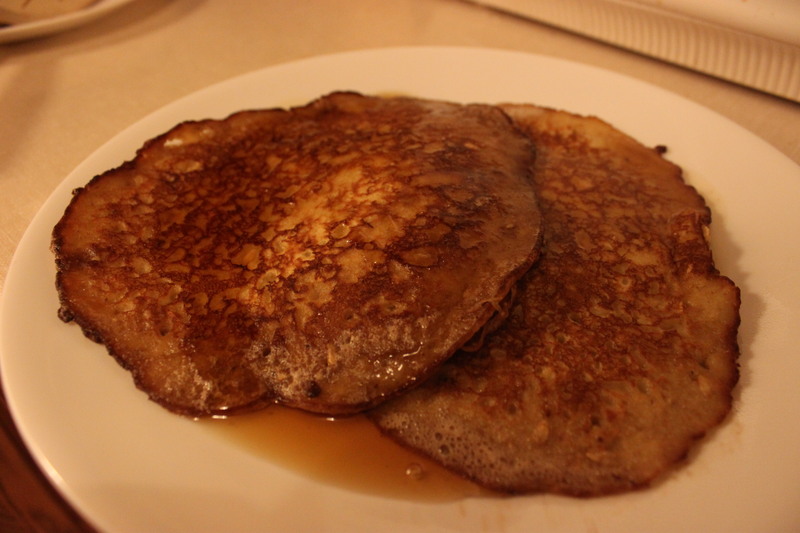 My family’s favourite: Buttermilk Oatmeal Pancakes! We had them for supper tonight – Woohoo! With lovely maple syrup, these are welcome anytime. Everyone was digging in – hahaha! I love it when they do. Made from scratch and a modified version of a recipe I found some 20 years ago, so I guess you could say it’s become a legit family recipe….?? I fry up pancakes in butter. Margarine was tried years ago, but it lost hands-down to butter. Hahaha! As some of you may have experienced, once a recipe gets used so often that you can pull it out of your head at will, then also the original measurements don’t all stay the same; some things get eyeballed for how the mix looks, for example, the dry ingredients being well blended with flours and oat flakes. And then once dry and wet ingredients have been mixed together, I like the batter to have a somewhat heavier consistency, so it doesn’t make runny pancakes but the kind that hold their shape in the hot pan….and yet flowing enough to create a thicker crèpe feel. And then on some occasions those “secret” ingredients get added in just to change things up! Like adding in chopped up fresh seasonal fruit. Having a bit of a sinus infection. Started late night on Sunday….got worse Tuesday evening. Been getting lots of rest. And on Wednesday there was a bit of relief and the hour spent outside in the early evening fresh air did some good. 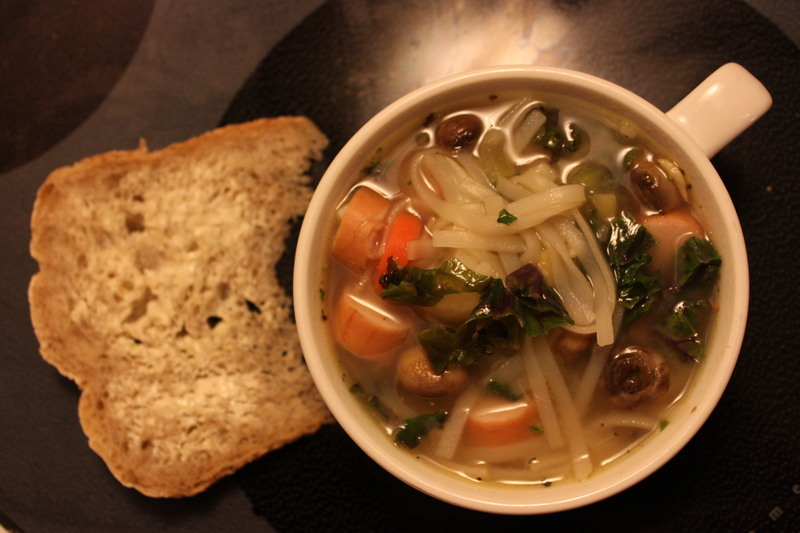 Then my tummy nudged me with requests for a bowl of soup that would hit the spot…..both nasally and digestively. Haha. So…..sautéing of the essential chopped onions and celery in olive oil, followed by some chopped fresh garlic and a slice of fresh ginger, also chopped. Mmm….the smell of ginger for the nose! Yes. Oh, and for something different, I added in some tiny button mushrooms. They always look so cute! The broth was a mixture of chicken stock, water, and light miso paste. This time I decided to go with lighter noodle fare and picked Asian rice noodles. Didn’t have tofu, so I sliced up a couple of weiners (keeps the lads happy, too). Let all that simmer. I found a handful of frozen veggies (carrots and broccoli) in the freezer and put them in for some added colour. Near the end some salt, pepper, and italian herbs with chopped up fresh kale….just until it softened. And it was ready for the eating! Everyone got a bowlful along with a slice of buttered fresh-baked bread. It was a big hit with my boys AND my eager-for-soothing-soul-food tummy. Yep….and we all went up for seconds! Okay…..so I didn’t pay close attention to the stove dial – getting re-acquainted with this stove (that’s my story and I’m sticking to it!) And what I thought was the simmer indicator was only high on the smaller element. Eek! 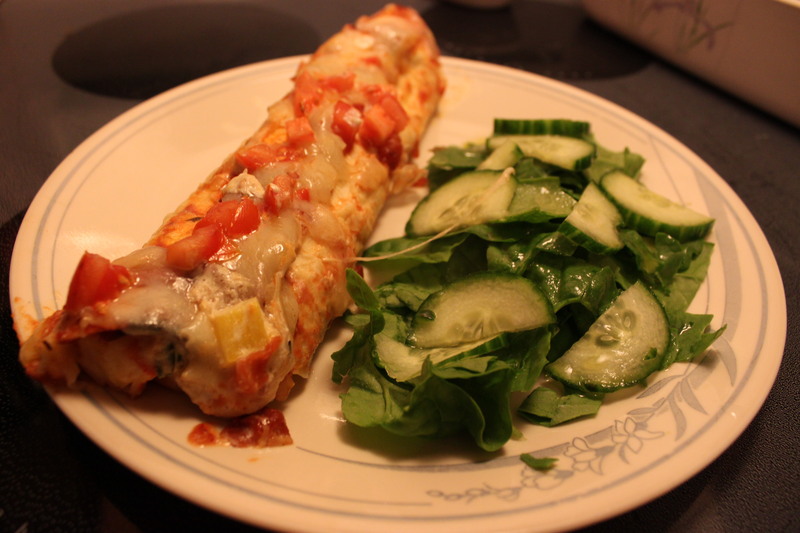 Yep, you guessed it….I burst the weiners for supper. On the bright side though, there’s more surface area for dipping into the mustard!! 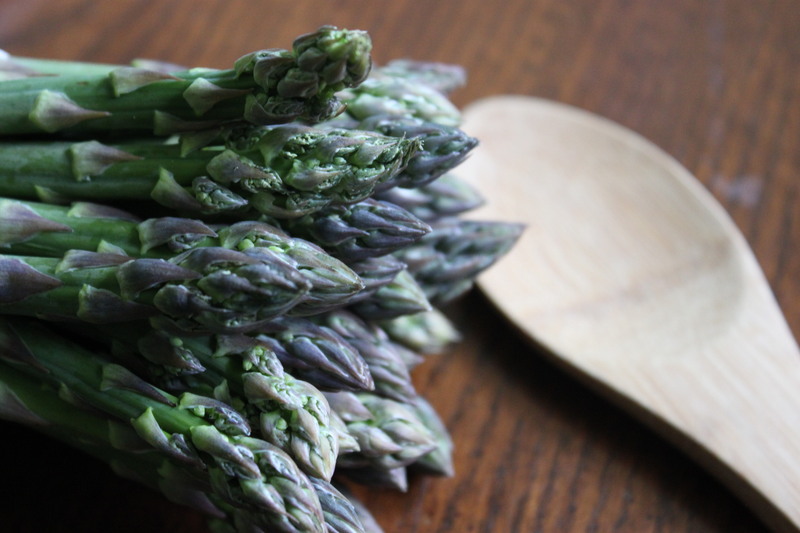 And well, the steamed asparagus still turned out tender-crisp and tasty. That’s ‘cuz I was paying more attention to them….than the weiners. Since I’m on the subject of food, what do you do, when you have good intentions of making a chicken goulash, only to find out mid-way – with the requisite staples of chopped onions, garlic, celery, and green pepper having softened nicely in the pot and awaiting the much loved generous sprinklings of paprika? Well, on account of there must still be a bin somewhere…unopened….with the remaining jars of herbs and spices. But I haven’t got time to LOOK for that! My veggies cannot wait a moment longer. 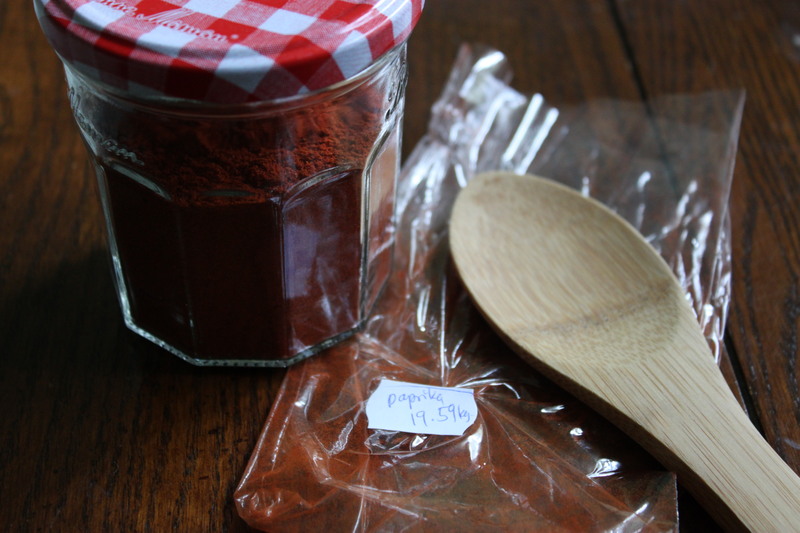 So, I rummage through my spice jars and grab some cajun spices – ooooohhhh! Hmmmm…..let’s see what I can come up with now….. Generous sprinklings of cajun spice then leads to…..found the ground chipotle in the cupboard up top – oh yeah! Gotta add some of that! And then in the pantry I find a jar of salsa. So, then a few drops of red wine (emptied the bottle used for the cacciatore of two days ago) – literally, a few drops, almost negligible – some stock….and it all goes to simmer into a flavourful saucy chicken dish with a really nice spicy bite to it! I think it makes up for the wieners I burst…..even though the order is reversed – hahaha! Chicken yesterday, weiners today! Note: The paprika in the photo is the new batch I picked up at the natural food store the next day. Note2: Felt like digressing from poetry to food….haha!